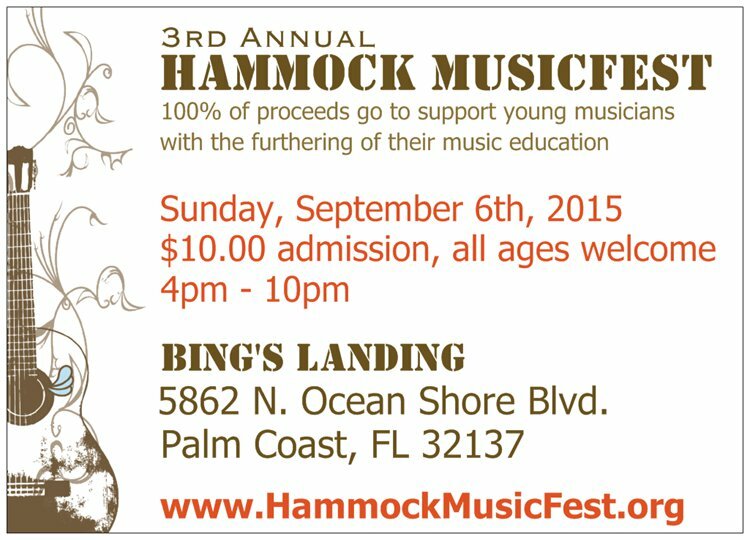 PALM COAST, Fla. – Hammock MusicFest will be taking place at Bings Landing, on Sept. 6. The festival is all ages and it will begin at 4 p.m. and conclude at 10 p.m. The goal for Hammock MusicFest is to raise $15,000. 100% of the proceeds will then go towards helping aspiring musicians further enhance their music education. Funds from scholarships, grants and sponsorships will help further advance the musicians education. Also—the contribution goes towards instruments, attend performance competition and music education events sponsored throughout different levels of education. Hammock MusicFest also focuses on funding music programs in schools on the verge of being cut, due to the shortage of school budgets. In time, the festival hopes it can help maintain overall education curriculums in the municipal areas. Musical acts slated to appear include: The Stacy Mitchhart Band (Nashville, Tenn.), Eddie Uzzle and Parrallel, Kenny and the Jets, Jeremy and Andrea Mix and the 2015 scholarship recipients. James Stup and Dallas Rinek, will also be performing. They were the 2014 Hammock MusicFest scholarship recipients and will be presented awards. Mitchhart’s latest album, “Live My Life”, has 12 tracks. Through his constant international touring, he became the ambassador of the Music City blues scene in Nashville, Tenn. Eddie Uzzle and Parallel are based out of Daytona, Fla. They perform weekly at the Racing’s North Turn. Uzzle performs solo at Inlet Harbor, for 12 years. Kenny and The Jets roots stem from St. Augustine, Fla. Forming In Jan., the band consists of: Kensley Stewart, Jacob Hamilton, J. Lee Driskell and Kevin Mileski. The Jeremy and Andrea Mix (The Jam) is a husband and wife duo. They perform a variety of cover songs, ranging from classic rock to adult contemporary. Rinek is a student at Florida Atlantic University. After he obtains his bachelor’s degree, he hopes to pursue his master’s degree in the field of Music Production. Stup is a student at University of North Florida and pursuing a bachelor’s degree in Jazz Studies. After completing his studies, he hopes to become a professor. The sponsors of Hammock MusicFest include 386 Restaurant, Atlantic Foot & Ankle, Berkshire Hathaway, Bings Landing, Brown & Brown Insurance, Captains BBQ, Coastal Cloud, Daytona Beverage, Doctors Choice, Intracoastal Bank, MacDuff Underwriters, Mid Florida Sports Wear, Rinek Construction and The Humidor Cigar Bar. To visit Hammock MusicFest’s website, please click here. To “Like” them on facebook, please click here.